Seemed like my early season hunting dreams went up in smoke when the youth model .20-gauge I bought for my son kicked up as well. Gave him a good shot in the choppers, and it was totally my bad. Should have probably tried it first without him. But I didn't and now he has a lifetime story of the first time he went shooting with his dumb-bleep dad. I'll give him credit though, he saddled up for two other shots with Dad making a better brace. For now, we'll walk away from it and hopefully he'll grow into the gun in the next couple of months. (I should have bought the bow I saw for him instead -- hey, I might still ... shhhhhhh, quiet about this one). 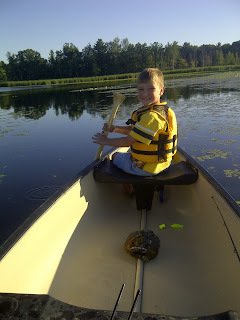 Anyway, we did go on what is likely the last fishing gig of the summer two weeks ago (Aug. 15) on a small lake in Lapeer County that was perfect for introducing the canoe to Zac and Dad to being in the canoe with Zac, if you know what I mean. Zac did a great job commandeering our canoe on Five Lakes in Lapeer County on Aug. 15. I only yelled at him once, well, maybe twice. Zac and I have canoed together before a couple of years ago on a fairly active river in West Virginia -- the South Branch of the Potomac River -- during a driving rain storm that he still remembers to this day. Mainly, him getting out on the shore and diving and splashing with our mixed Lab into what was the best hole for fish. Oh yeah, lots of fun there. I still remember the trip because he had more sense than I did in when to quit, saying matter-of-factly as I tried to hit "one more spot" with a cast as the rain started coming down sideways -- "Hey, Dad, give me the paddle, would you? Let's get out of here." Gives me chuckles to this day. When it comes to fishing and hunting, sometimes I get a little lost in it all. It's OK if he wants to go and just watch the goose hunting action Sept. 1, because I don't want to be one of those dads who gets overbearing and then instead turns his kid off from doing something. One regimen I'm trying to get into is busting down the ATV trail on a regular basis in the backyard to prepare for possibly taking the quad bear hunting this October in the Upper Peninsula. On Wednesday, Zac didn't have a problem getting on the quad, nor turning over the controls, when he felt the Suzuki was still a bit too big for him. Something I appreciated. Maybe we need to take this growing up stuff a little slower. Dang, now my shoulders are hurting. Lured into shooting my bow?